Since its inception over 200 years ago, homeopathy has fallen in and out of favor. Its apparent resurgence in these times has rekindled the discussion as to whether homeopathic medications are an effective treatment against disease or whether they are no more than an elaborate placebo. The discussion as to whether or not it is an effective therapy is ongoing in human and veterinary medicine; it appears to have devolved into one between proponents of homeopathy and those who rely on firm evidence of effectiveness before adopting any therapy. This paper attempts to assess the state of the current evidence regarding homeopathy. The 65th International Homeopathic Congress of Liga Medicorum Homeopathica Internationalis held from 18-22 May 2010 at Los Angeles, United States of America discussed the issue elaborately and several speakers presented their latest research findings on homoeopathy from the view point of Physics, Chemistry and biological sciences and explained the basis of homeopathic medicine action. Some latest theories viz. Quasi Quantum Phenomena, Weak Quantum theory, Non Local Phenomena, Water memory theory and unexpected behavior or mysteries of water etc. gave plausible explanation of the modus operandi of homoeopathic medicines. The physical and chemical basis of the microcosmic and microscopic behavior of substances is being investigated by several scientists to unravel the mysteries of nano particles and their different behavior from their parent molecules. Though this research does not mention any thing about the ultra dilutions of homeopathy, yet they discuss the importance of reducing the quantity of substances and increasing the quality of them in view of several commercial advantages hidden in this field. Homoeopaths have to wait for some more years to get a solid scientific basis of the theory of dynamisation and ultra dilutions. Now the ball is in the court of the scientists to substantiate and find out the scientific basis of irrefutable clinical evidences of homeopaths over two centuries. The discussion on the scientific basis of homeopathy has always generated more heat than light. The scientific world demands a solid physical and chemical basis of homoeopathy, but the basic sciences are at loss in offering such a scientific proof. May be the future science can find out a suitable model to unravel this mystery. Homeopathy is not quackery but it is the future of medicine. Every science needs two types of evidences viz., scientific or statistical and clinical evidence. These are the two sides of the coin. However, the scientists are not in a position to see the other side of the coin of several natural phenomena in general and homoeopathy in particular for various reasons. In my view a concerted and sincere effort is needed on the part of the scientists to unravel the mystery behind this unexplored and imponderable side of homeopathy. The homoeopaths on their part ever since Hahnemann’s time are showing the strong clinical evidences of action of homeopathic medicines in the human, animal and plant life. The “ homoeopathic phenomena “ has exploded all over the world; from an alternative medicine for a select few it has become the alternative medicine for millions of human-beings. Now it is the responsibility of the scientist to evolve a protocol for validating the clinical efficacy of homeopathy through their ever changing and advancing techniques in the field of immunology, genetics, nano pharmacology and quantum physics etc. The proof of validating homoeopathy rests with scientist rather than with practitioners of homoeopathy. Unfortunately the half baked scientists throw blame on the science rather than admitting their limitations. It is high time we work together for the cause of mankind by blending the science and technology with the art of medicine. Many authors writing in international non-homeopathic medical journals have investigated the reasons why homeopathy is so successful (Campion, 1993;Sutherland, 1994; Vincent, 1996; Astin, 1998; Horton, 1998). Leaving aside criticisms which are biased and prejudiced rather than objective and scientific, and “philosophical” rather than rational, the answer is simple and obvious: homeopathy works. However, it is necessary to investigate the types of illness in which its therapeutic activity works best, and explore its limitations and boundaries. “… Science is not an opinion. In the scientific field, things are black and white: either a treatment works or it doesn’t, and if it works, it must be possible to demonstrate it. Once a result has been obtained with reliable experiments, you have to abide by it” (Prof. U. Veronesi – answer to a question published in Oggi magazine: 5-11-2001). The world of homeopathic research is moving in the direction of investigating its rational, explicable, demonstrable, reproducible aspects and neglecting the more controversial and doubtful aspects. The purpose of this paper is to review the extensive literature available, and draw the reader’s attention to studies that comply with the strictest scientific methodologies. Approximately 400 publications obtainable from international data bases (Medline, Embase, Biosis, the British Library, Stock Alert Service, SIGLE, Amed, etc.) 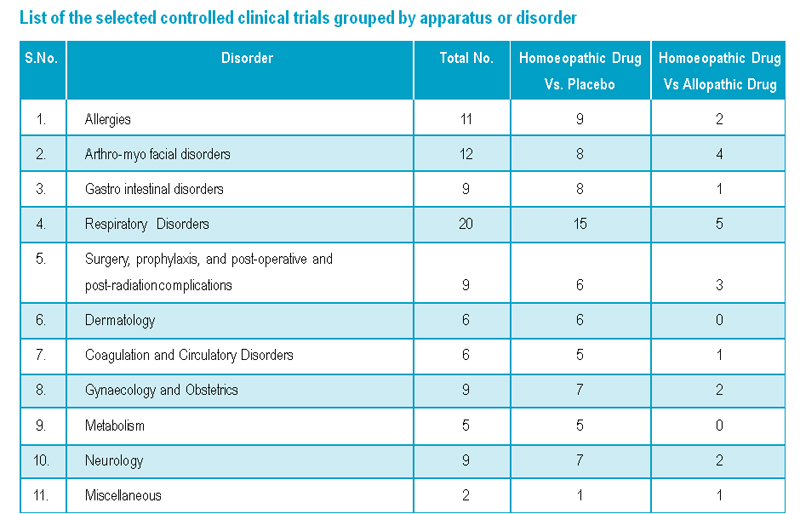 which relate to controlled clinical trials of nosographically defined disorders (accounting for approx. 80% of the homeopathy studies conducted up to December 2009) demonstrate the therapeutic efficacy of the homeopathic drug tested. No less than 98 studies (25%) were indexed in Medline between 1998 and 2009 alone, clearly indicating researchers’ increasing interest in homeopathy. 127 studies relating to controlled human clinical trials which provide valid, unequivocal information about the therapeutic effect of the drug in question have consequently been selected. 106 studies were done on Homeopathic medicines versus placebo and 21 studies were on Homoeopathic medicines versus conventional medicines. Of the 106 studies 77 (72.6%) demonstrated that the homoeopathic medicine was SUPERIOR to the placebo. Of the 21 studies (100 %) demonstrated the homoeopathic medicines was not therapeutically inferior to the corresponding allopathic drug. The term inferior means EQUAL OR SUPERIOR TO. 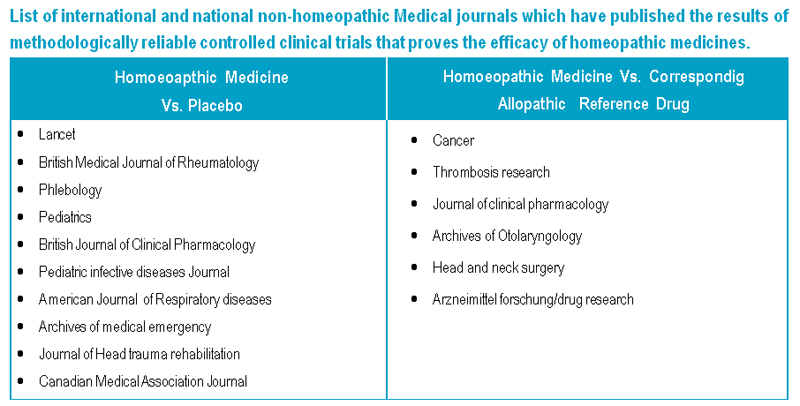 Many favorable results obtained with homeopathic medicines as a result of methodologically correct studies are published in homeopathic journals and merely ignored, censored, minimized or hyper-criticized by official allopathic journals, perhaps for fear of taking a favorable approach to a subject that is still controversial. Despite the problem of publication bias, many prestigious national and international journals have published and given the right degree of emphasis to well-conducted homeopathic clinical trials simply because “the findings speak for themselves”, and science must take an impartial view. Until recently, it was often said that homeopathy cannot be considered a valid treatment because of the lack of scientific data. The impossibility of supplying scientific data seemed to be due to the very nature of the discipline founded by C.F.S. Hahnemann, firstly because it uses medicines at such low dilutions that they are sometimes actually undetectable, and secondly because of the customized nature of homeopathic treatment, which was alleged to make it impossible to apply standard protocols. As homeopathic medicine is based on different paradigms from conventional medicine, the very concepts of health and disease differ considerably between the two approaches, and the view of man as a holistic unit is exclusively held by practitioners of homeopathic medicine, it might seem impossible to define standard clinical protocols. However, thanks to the efforts of independent researchers, some major studies demonstrate that homeopathic protocols can perfectly fit the methodological standards used in conventional medicine and be published in prestigious international journals. In nosologically defined disorders, in which “personalisation” of symptoms is limited, experimental clinical research protocols can also be applied to evaluate the efficacy of the most appropriate homeopathic medicines. Numerous experimental studies have been conducted on this basis, and their methodological level has progressively improved over the years. Nevertheless, most of the members of the medical profession and the media have failed to perceive the existence of this body of studies, which demonstrate the therapeutic efficacy of homeopathic medicines. The aim of this paper is to fill this lack of information by a compendium made of some of the latest and most significant literature in the field. Very briefly, a large body of studies demonstrates that the efficacy of homeopathic medicines is not due to the “mythical” placebo effect, thus finally dispelling a series of superficial, prejudiced attitudes. Among these, a set of studies compare homeopathic vs allopathic medicines. These trials were conducted in accordance with Helsinki Declaration on the therapeutic efficacy. These studies demonstrate that the effect of homeopathic medicines may be at least similar to that of the allopathic reference drug used for the same disorder. They also confirm that homeopathic medicines, unlike allopathic drugs, rarely produce side effects. Finally, they show that homeopathic remedies are usually cheaper, and in some cases much cheaper, than the corresponding conventional treatment. But the industry of medicine wants the costly medicines which are profitable to the maker than the user. Everybody is entitled to his own opinion and can deny the evidence, even when faced with the clearest proof. But who hold public and institutional offices and responsibilities have the duty to analyze actively all the body of information that may improve the patient’s quality of life. I hope that widespread circulation of this information will enable an increasing number of people to form an objective opinion about homeopathy, which has been so controversial for many years. I also hope that the consequent awareness of those who hold international, national and local responsibilities in the health field will lead to substantial improvements in the health of the population in the near future. It may seem paradoxical that tiny amounts of an active constituent (diluted by the very special process of homeopathic production) can produce effects on living beings, but this is evidently a scientific fact. Science acts on the basis of objective, verifiable observations; if the event demonstrated cannot be interpreted by a theory, it is the theory that needs to be revised. This is the principle behind the progress of science. I trust that subjective opinions will leave room for the objective findings of laboratories and clinical research centers, so that full medical integration can be achieved, without losing the specific identity of different therapeutic approaches, as this would be the most appropriate prelude to the new medicine of the third millennium. May homoeopathy flourish in the new millennium and may the almighty God shower the wisdom on the critics of homeopathy. 6. Peter Fisher, Editor, Homeopathy “Biological Models of Homoeopathy “ Proceedings of the 65th International Homoeopathic Congress of the Liga Medicorum Homeopathica Internationalis,18-22 May 2010, Los Angeles, U.S.A.
9. Dana Ullman MPH”A Review of Clinical Research on the Homeopathic Treatment of Respiratory Allergies” 2010.